About the challenge: Review 42 sci-fi related items: short stories, novellas, novels, radio show episodes, television show episodes, movies, graphic novels, comic books, audio books, essays about science fiction, biographies about sci-fi authors, etc. Hey Becky. 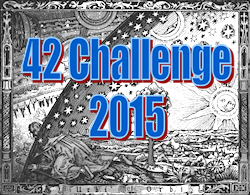 Welcome to the 42 SF Challenge for 2015. If you're like me, the reading or viewing of 42 items will be no problem. But getting the reviews written and posted could be a real challenge.